Your Pool Builder reviews and ratings from independently managed locations. We are proud of our location owners! "My experience went really well, our pool was pretty simple. We went with Mike because of the price and design. Thanks"
"With big wedding plans for our daughter we basically had 60 days to finish the backyard to host the ceremony. We didn't know how long it would take to finish the pool and if we would have enough time for landscaping plus everything we had to bring in. 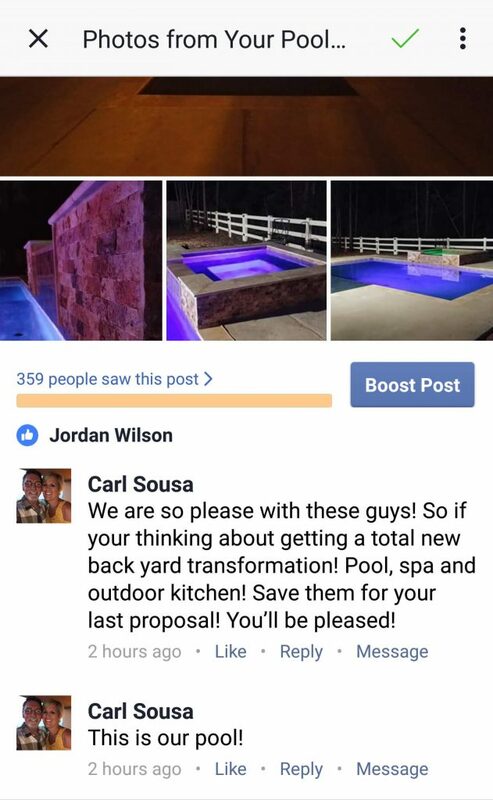 Actually had second thoughts if we should just change our plans completely, but we really wanted the pool after the wedding ;) Your Pool Builder met with us and our anxiety levels were lowered. We got to see how the process works and how long it would really take. It was clear to go with them and we are very pleased. Our girl had one beautiful wedding! BTW - the pool and outdoor living was done in 42 days, and the rest we got done a week before." 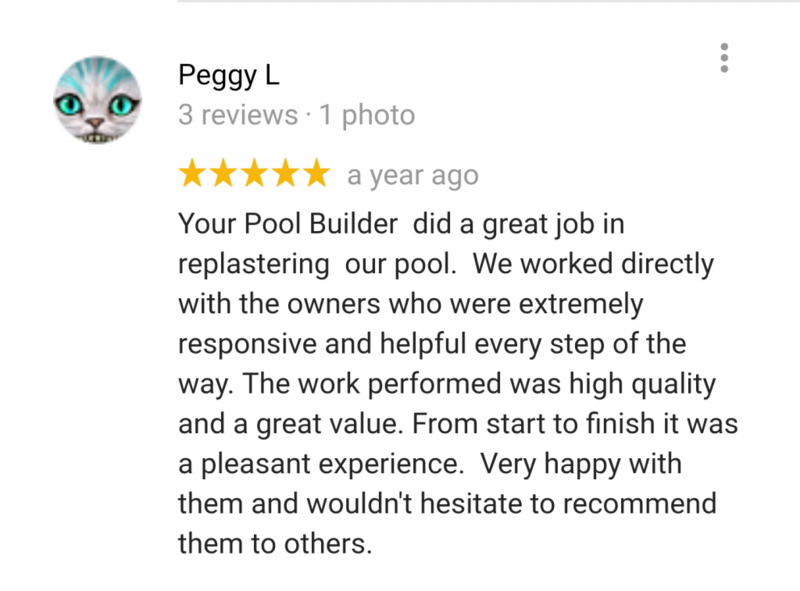 "We had made plans back in December to beginn the pool in the spring / summer but when we called to start scheduling they said they were booked and we would need to wait for the next available opening. We have a nice pool now but I would suggest that you don't call them until you are completely ready." "I love my pool! The time it took us to get started was excruciating, we waited on the ACC approval, and then waited for their scheduling. Took about 30 days or so to get started digging. 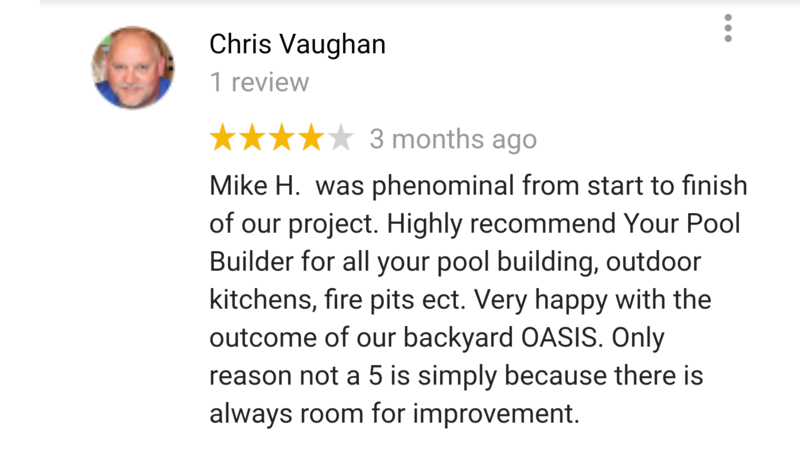 When we met Mike, we could clearly see the level of experience he has with building pools and our neighborhood. Staying later than henhad to just to make sure our side yard was clean and the neighbors did not complain. They get down and dirty and get the job done! After everything we absolutely love the end results and will refer Mike and his company. Time to swim :)"
"When we bought our new house in Montgomery we knew we wanted to install a pool soon. 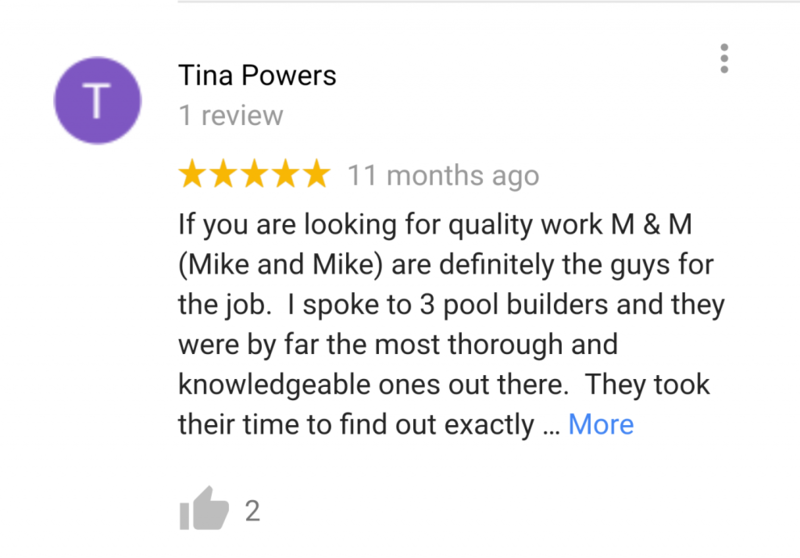 Went with Your Pool Builder in Montgomery because of a referral and Mike Willard is very professional and presents his pool company really well. Right away I could see how experienced he and his team are. We are not the easiest to please and my wife & I had big plans for the pool and backyard. We needed a design for the kids that was safe and fun, and also an area just for us. The pool took about 6 or 7 weeks I can't remember but it seemed to be on time and they even worked with my landscaper to help finish it off after the pool was done. I would recommend Your Pool Builder of Texas to anyone in the area. 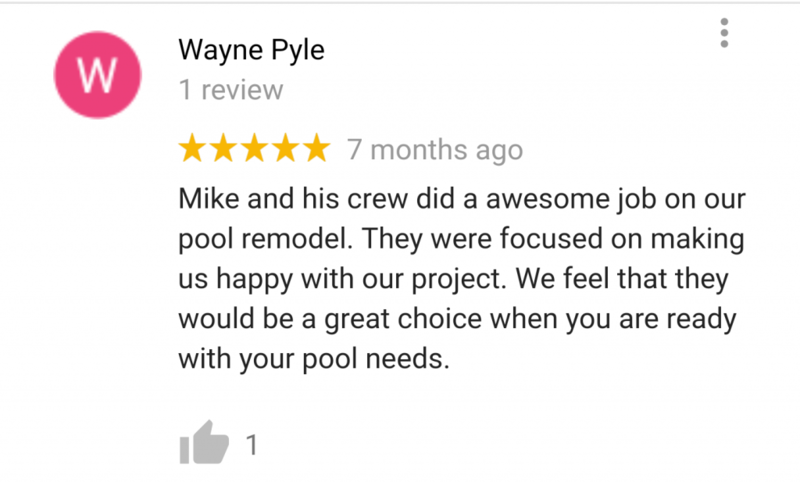 Thanks Mike we all love the pool and we have received many compliments on it." 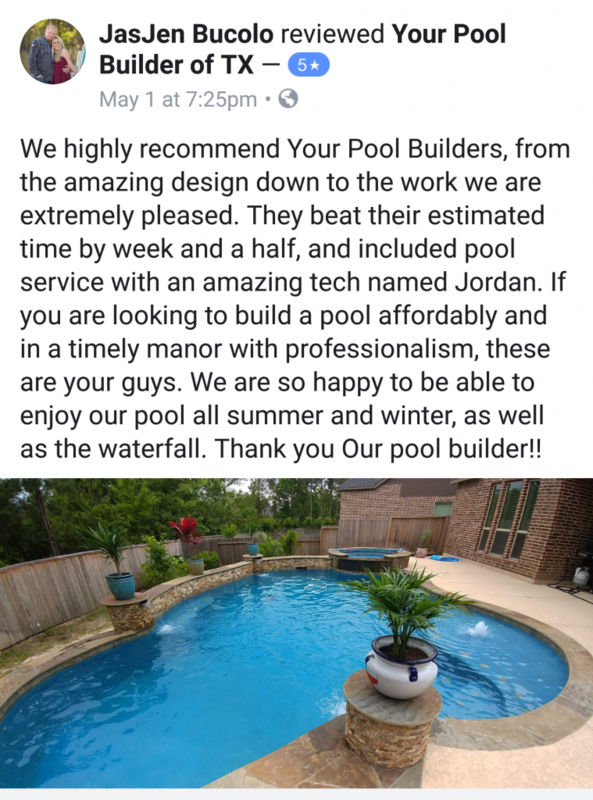 "We got in contact with Your Pool builder in Conroe from our neighbors pool service. It was so easy to deal with the construction, besides some mud for a few days we were impressed. We didn't pay anything at signing which was unexpected. Overall a good company. We love our pool. They are renovating my neighbors pool..."
"Great pool company. They advertise a pool Price of $29,000 that does not include a spa. Our pool ended up costing $32,000 with a few tweaks to the base model. 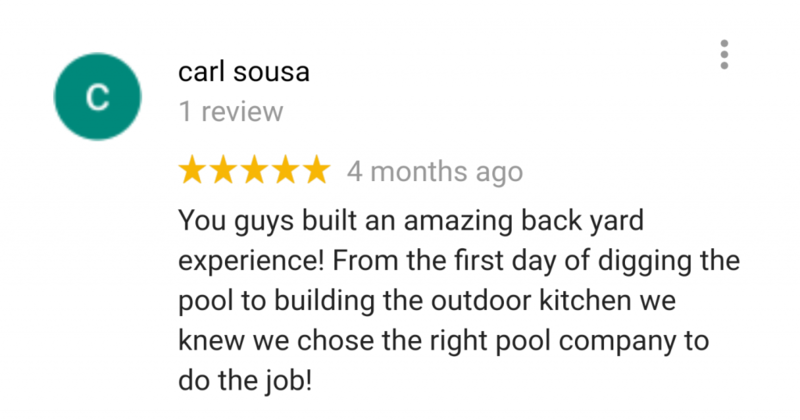 Overall we are satisfied with our pool and the performance of your Pool builder"
"Guys thank you so much, I was really about to make a terrible buying decision and now I have the perfect pool! 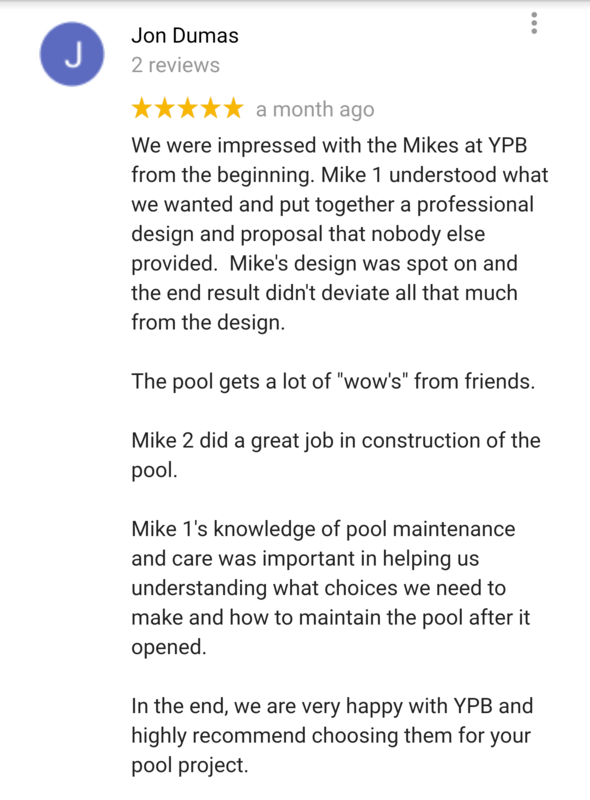 One of the biggest things that stands out to me is the honesty of this company, and the $0 down at signing was a really strong point as I had to wait on my Union Credit"
"Thanks to the service provided by Your Pool Builder, I felt more confident and secure having my pool built. We now have a BEAUTIFUL pool on Lake Livingston!"